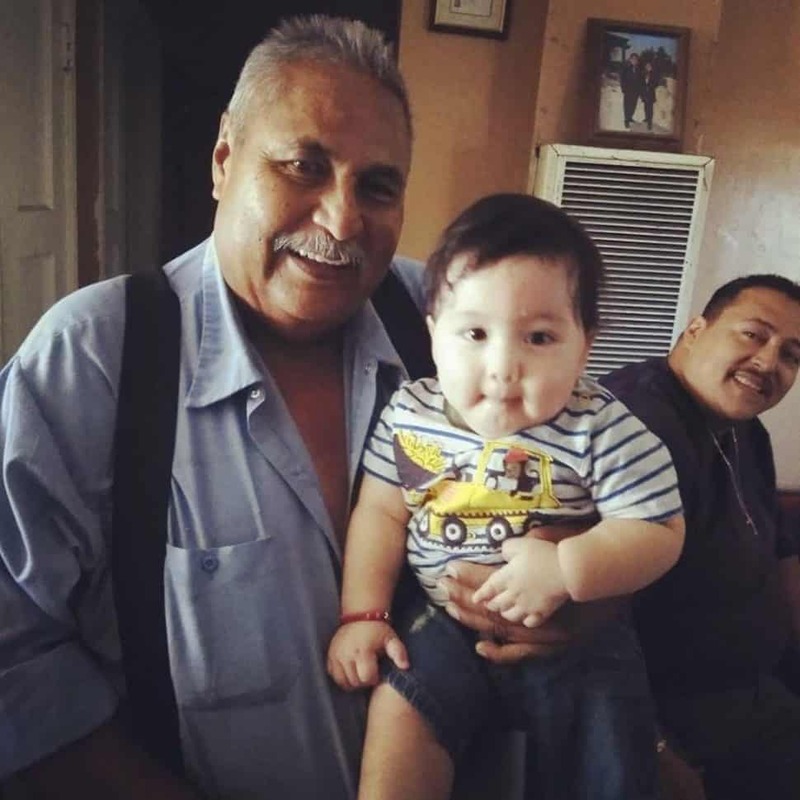 Jose Raul Corrales holds his great-grandson. Corrales was shot to death in West Long Beach on Oct. 9, 2018. Photo courtesy Jerry Amaya-Rodriguez. A 69-year-old man was killed around 3 p.m. Tuesday in a shooting a few blocks from Cabrillo High School, according to authorities. Neighbors said the man was watering his front yard near the corner of Summit Street and Canal Avenue when he was killed in a drive-by shooting. Authorities identified him as Jose Raul Corrales. “I was just sitting at home and heard seven to nine shots. I thought maybe it was fireworks, but within minutes I heard commotion and women screaming,” neighbor Rafal Mazur said. 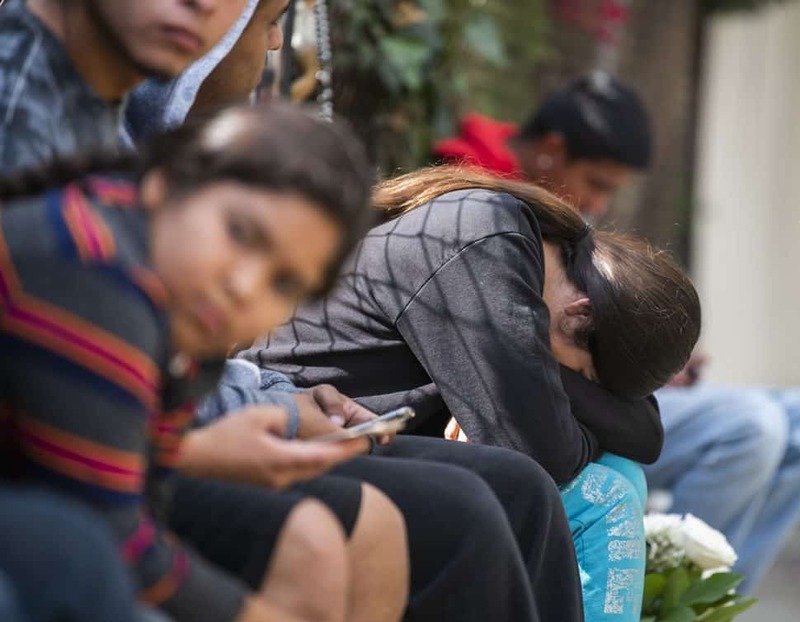 Brissa Ruiz, who knew the victim as a longtime family friend, had just returned from school around 2:40 p.m. when she saw neighbors gathered around his body waiting for police. 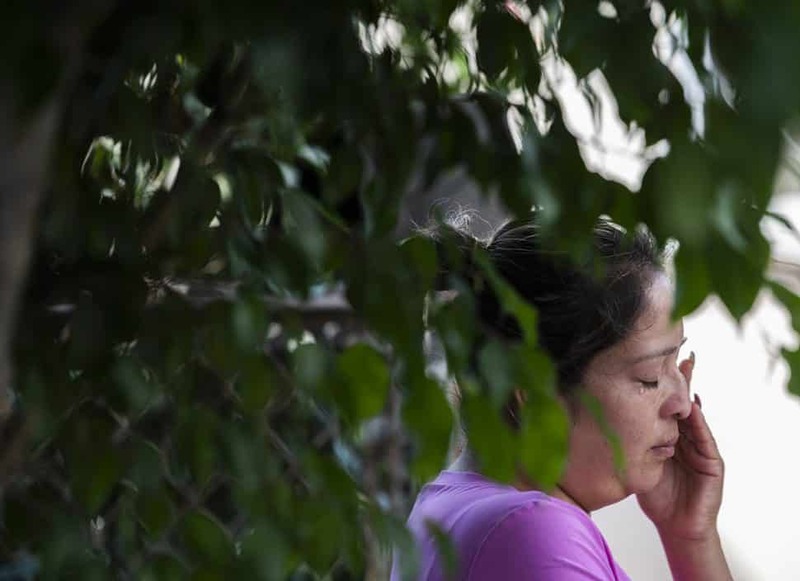 Rebecca Rodriguez, daughter, wipes tears from her eyes as the family of Jose Raul Corrales mourn his death the day after he was killed in Long Beach, Oct. 10, 2018. Photo by Thomas R Cordova. Corrales was a sweet man, she said, and a mechanic who often fixed cars at his home. Mazur said he leaves behind a wife, children and grandchildren. “I saw a boy crying and asked if that was his brother or father and he said, ‘That’s my grandpa,'” Mazur said. Corrales died at the scene, according to police spokeswoman Arantxa Chavarria. He’d been shot in the torso, she said. “Detectives learned the victim was outside a residence with a group of male subjects when a light-colored sedan containing three to four subjects opened fire,” a police news release stated. Another man in a nearby vehicle was also shot, but drove himself to a local hospital, police said. Detectives are investigating the incident as gang related. 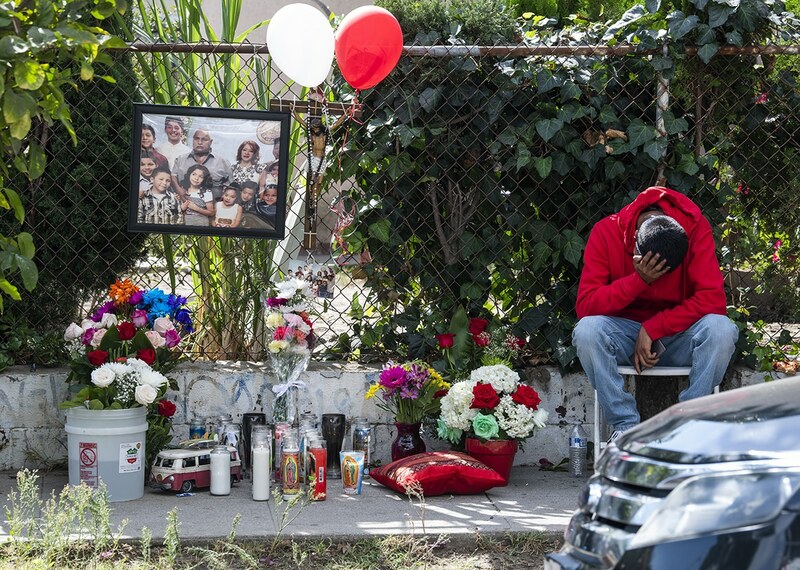 One of Jose Raul Corrales grandkids sits next to his makeshift altar the day after he was killed in Long Beach Oct. 10, 2018. Photo by Thomas R Cordova. 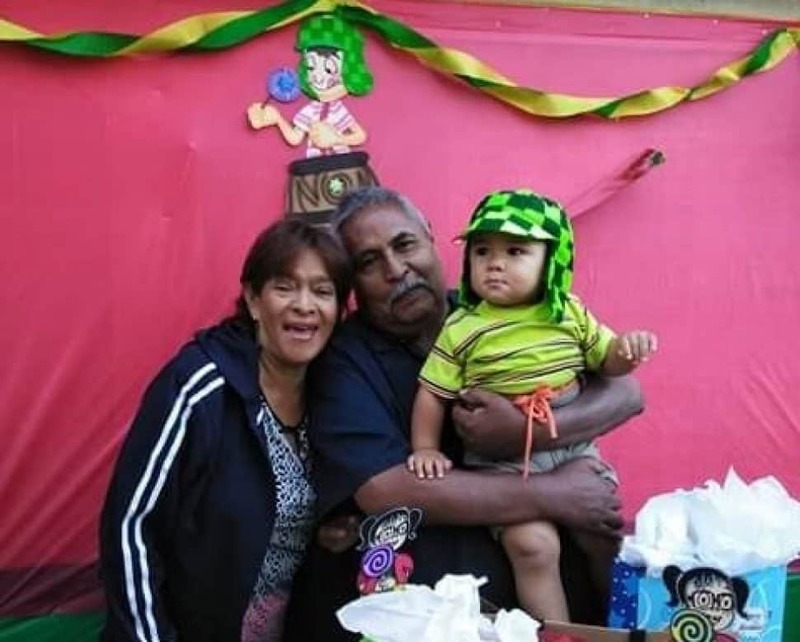 Corrales was a rock for his family, according to one of his grandchildren, 22-year-old Jerry Amaya-Rodriguez. Amaya-Rodriguez and his cousins used to gather at their grandparents’ home on Canal after school. Corrales also took care of his wife, who needs to be taken to dialysis treatments three times a week, according to Amaya-Rodriguez. Jose Raul Corrales with his wife and grandson. Corrales was shot to death in West Long Beach on Oct. 9, 2018. Photo courtesy Jerry Amaya-Rodriguez. Wednesday morning, he said he’s still in shock that a stray bullet took his grandfather’s life while he was going through his daily routine of watering the lawn. “He wasn’t at the wrong place at the wrong time. He was at his house,” Amaya-Rodriguez said. Amaya-Rodriguez said he remembers hearing gunfire from drive-by shootings while he was growing up in the area, but he never expected the violence to take his grandfather. “I still can’t believe it. I really can’t even believe it,” he said. One of the granddaughters mourn the death of her grandfather Jose Raul Corrales the day after he was killed in Long Beach Oct. 10, 2018. Photo by Thomas R Cordova. The investigation is active and ongoing, Chavarria said. No arrests have been announced. Amaya-Rodriguez said the family is collecting donations for funeral expenses on gofundme.com. Anyone with any information regarding the incident is urged to contact LBPD Homicide Detectives Michael Hubbard and Adrian Garcia at (562) 570-7244. Anonymous tips may be submitted through “LA Crime Stoppers” by calling 800-222-TIPS (8477), downloading the “P3 Tips” app to your smartphone (available at the Apple app store or Google Play), or by visiting www.crimestoppers.org. Editor’s note: This story was updated Wednesday morning with Corrales’ name and more information about him, then updated again Thursday morning with more information about the shooting and police investigation. 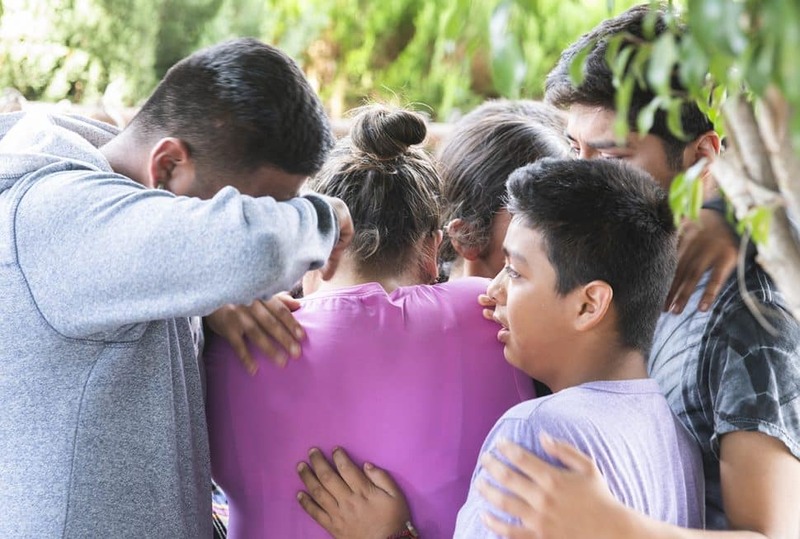 Family gathers around Rebecca Rodriguez, daughter, to comfort her after the death of her father Jose Raul Corrales the day after he was killed in Long Beach, Oct. 10, 2018. Photo by Thomas R Cordova.